Regular communication with your prospective backers is the difference between success and failure for your crowdfunding campaign. Follow up on your pre-launch communiques with a fun, consistent communication program during your campaign to maximize your chances of success. Many of our clients find it hard to share their message more than once – or even just once. But it’s important to stick to the discipline. 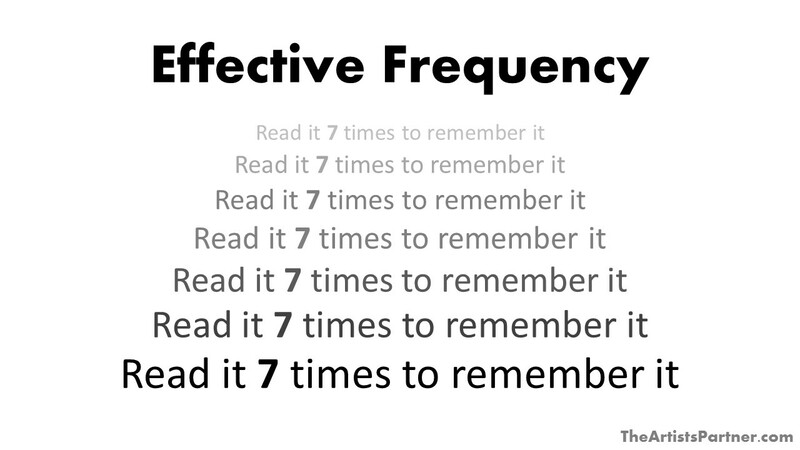 It’s based on one of the central tenets of marketing: effective frequency, or “the rule of seven.” Most people need to hear a message 7 times to act on it. How else to help the campaign. We invite readers to share the link on social media, forward the email to friends, and send us good luck wishes. What crowdfunding is, and how it works. Lots of people know what Kickstarter and Indiegogo are – but lots don’t. We provide a short sentence of background (these platforms have been around for years and have raised over a billion dollars), and then step-by-step instructions on how to pledge, complete with images. 6 Weeks of Thursday Campaign Updates and Social Media Posts. Both Indiegogo and Kickstarter have a blog function, where you can periodically post new information and other fun tidbits for your backers and visitors to your campaign. This is usually a remixed version of the Wednesday email. Updates get their own unique web address, so we usually post the update to social media as well. 6 Weeks of Friday Phone Calls. Each week we identify a key group of people to contact. These can be your Day 1 Backers, Influencers, and Benefactors; but we also reach out to the less tech-savvy people in your network to see if they need help navigating the pledging process, and we try to get in at least one phone call to everyone in your network. Every campaign is different, but there is a fairly reliable pattern to what we are communicating by week. Week 1: Countdown, LIVE!, and 24-Hour Thank Yous! Launch Day is the most important day of the campaign. We remind your Day 1 Backers and Benefactors that they are invited to the exclusive VIP Soft Launch the day before the official launch, we do a public social media countdown for launch day, and after the first 0fficial 24 hours, we do a big Thank You message (which doubles as a nudge to anyone who planned to pledge on launch day, but didn’t get around to it). We craft a special series of images to use on social media, in emails, and in the campaign update. Week 2: Event Invitation. We shouldn’t just say the same thing over and over, so this is a great time to focus on a mid-campaign event in the real world (dedicated post coming soon). Week 3: Event Recap. And, one of the great things about an event is that it gives all kinds of great new photos and video to share. Week 4: Milestones, Previews, and Stretch Goals. This can be an ideal time to share progress, and preview what’s coming next. Often, this is a good time to share a sneak preview of another chapter, a new song, a film scene, or anything else that makes it feel like this campaign is propelling your project to success. If the campaign is fortunate enough to have surpassed its initial target, this is also a perfect opportunity to show off stretch goals (dedicated post coming soon). Week 5: LAST CHANCE! We mirror the Week 1 countdown to launch with a countdown to the deadline. Campaign funding tends to be U-shaped, with most pledges coming in on the first day and the last day (deadlines motivate people!). This is another opportunity for serial social media posts that remind prospective backers of the approaching last chance to participate. Week 6: Thank You! and What’s Next? Finally, we follow up after the campaign is closed to thank backers profusely, let people who didn’t get on board in time know what they can still do to get involved, and let everyone know what to expect next from the project – further steps until completion, when to expect the finished product, and when their perks will be delivered. It bears repeating: our clients find this hard. The key to making it work is picking a discipline, and sticking with it. 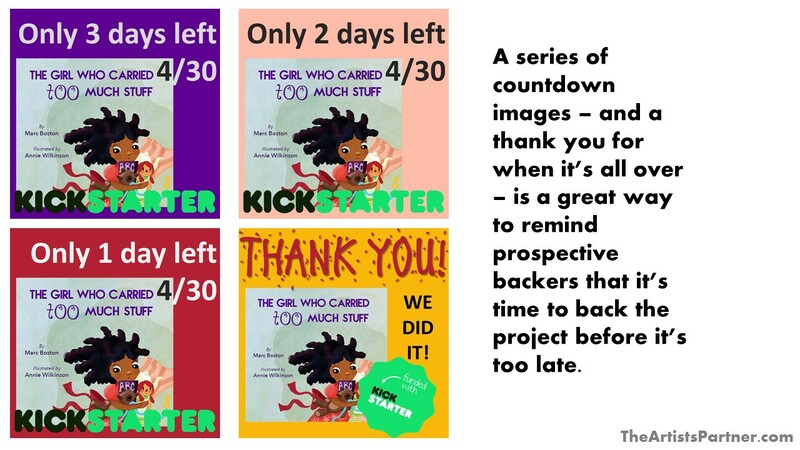 You know your prospective backers need to hear your message 7 times to act on it. Use all the tools at your disposal and when the going gets tough – and it almost certainly will – dig deep, hang in there, and keep up the good work. Your campaign depends on it.